model is an actual .375 H & H Mag Shell. What a special gift for the hunter or outdoors enthusiast. Inside is a Raw Brass Cartridge Space Pen. Please note! This pen is RAW Brass, just as bullets are. That means there is no finish on the brass. Each one will have its own unique look. Over time a nice patina will develop. 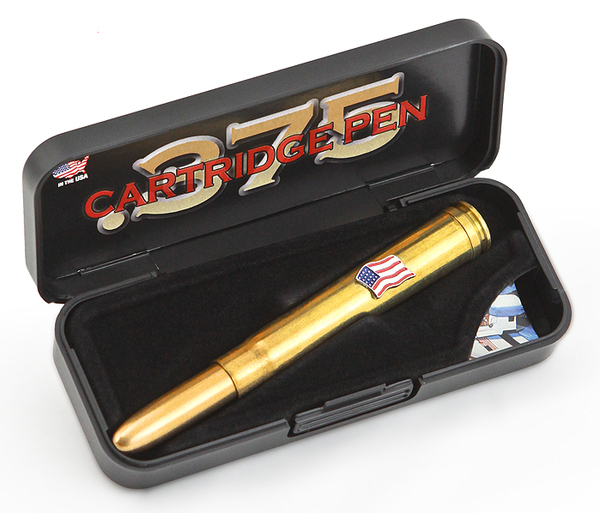 We recommend you never fly with your .375 Cartridge Space Pen. TSA sometimes won't believe it's a writing instrument! We want you to enjoy your Space Pen for a long, long time. When closed, Cartridge Space Pens are the perfect size to carry in your wallet, pocket, purse, car glove box, organizer, or toolbox. When open, it's a full sized, evenly balanced writing instrument. The original Bullet Space Pen was conceived in July of 1948. Paul Fisher was soon machining a new pen design shaped from solid aluminum. It became our first Fisher ball point pen, the 400 Bullet Pen, and arguably the most popular pen of the twentieth century. This pen is now all brass with a raw brass finish.